A wonderful den to burrow and cuddle! Houses are made out of two layers of fleece, they are durable, safe and cozy. The dimentions are 9”L x 8”W x 6”H. Our Houses provide a comforting sense of security for chinchillas, ferrets, rats, guinea pigs, degus, sugar gliders and have an added benefit. 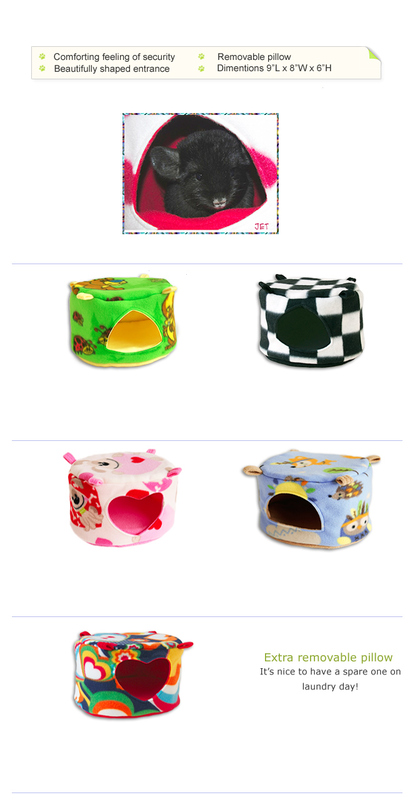 They can be used as a snugly hideaway and a bed (fuzzies also love to sleep on top of the house, and if you place a shelf just several inches below the house, pets will love to squish themselves there too)! All our Fleece Cage Accessories are made out of Blizzard and/or Anti Pill Fleece. These types of fleece are considered safest for pets. They do not unravel into loose threads as other fabrics do (ingested long threads can cause and intestinal blockage, threads can also get wrapped around a tooth, toe or foot) and do not contain fibers that can be easily ingested. All seams are enclosed. Houses come with nickel-plated hardware, so no worries about zinc toxicity. Please make sure that your fuzz ball can easily access the house to prevent falls and please insure that all pear links are tightly fastened to avoid injuries. Houses are machine washable (cold/warm water, gentle cycle) and dryable (low heat, remove promptly).